“Social media is anything but a new phenomenon. From the papyrus letters that Cicero and other Roman statesmen used to exchange news, to the hand-printed tracts of the Reformation and the pamphlets that spread propaganda during the American and French revolutions, the ways people shared information with their peers in the past are echoed in the present. After decades of newspapers, radio, and television dominating the dissemination of information to the masses, the Internet has spawned a reemergence of social media as a powerful way for individuals to share information with their friends, driving public discourse in new ways. 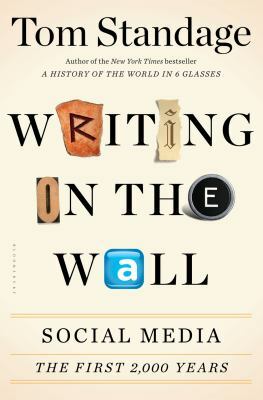 Writing On the Wall reminds us how historical social networks have much in common with modern social media. The Catholic Church’s dilemmas in responding to Martin Luther’s attacks are similar to those of today’s large institutions in responding to criticism on the Internet, for example, and seventeenth-century complaints about the distractions of coffeehouses mirror modern concerns about social media. Invoking figures from Thomas Paine to Vinton Cerf, co-inventor of the Internet, Standage explores themes that have long been debated, from the tension between freedom of expression and censorship to social media’s role in spurring innovation and fomenting revolution.